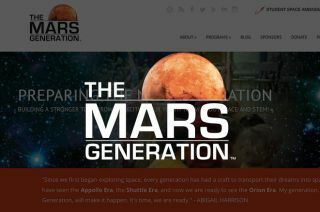 The Mars Generation, launched on Sept. 15, 2015, aims to prepare the next generation of space buffs by getting youth excited about space and science education. Abigail Harrison wasn't alive to see the moon landings. She wasn't alive to witness the first space shuttle launch. And she's not even old enough to remember the start of the International Space Station. But for almost for her entire life, the 18-year-old from Minneapolis has dreamed of being an astronaut. More specifically, she has set her personal goal to be a part of the first crew to land on Mars. For the past five years, under the social media identity "Astronaut Abby," Harrison has gone about not only advancing her own dream, but sharing her passion for space exploration with tens of thousands of students her age and younger. Abigail Harrison, known on social media and online as "Astronaut Abby," has joined with astronauts, space program workers and others to form The Mars Generation, a new nonprofit organization dedicated to getting people excited about space exploration. "In the past, a lot of the things I did were about sharing my own journey and doing a lot of the work on my own," Harrison explains. "The exciting thing about founding The Mars Generation is that I am not doing it alone anymore." Today (Sept. 15), Harrison, joined by astronauts, space program workers, social media experts and others, launched The Mars Generation, a nonprofit organization devoted to raising recognition of, and a renewed investment in, space exploration. "The exciting thing about founding The Mars Generation is that I am not doing it alone," Harrison told Space.com. "I am founding it with an incredible advisory board and founding board — people who have expertise in all types of areas who are able to now share their experiences, their abilities, their talents and their contributions with students and adults around the world in a way that I never could." In addition to continuing the online and real world educational outreach activities that have been part of Harrison's Astronaut Abby activities up to now, The Mars Generation will also now be organizing a student space ambassador program. "Over the years I have met a lot of students who want to be involved in space travel or the space program — not just doing the science or the engineering or becoming an astronaut, but wanting to be ambassadors for their own communities," Harrison said. The Mars Generation's mentorship program will teach students ages 13 through 24 how best to get involved in their communities, use social media to their advantage and advance their own outreach activities. In another of its new programs, the organization will award scholarships for students to attend Space Camp at the U.S. Space & Rocket Center in Huntsville, Alabama. "There are scholarships for Space Camp already, but there aren't that many out there that are either fully paid or provide travel expenses," Harrison explained. "For students who are living in poverty, even scholarships that are fully paid but do not provide travel still do not do enough because they and their communities are not able to meet that travel fees." Above all, Harrison sees The Mars Generation as an opportunity to get people to understand why space exploration is important, why it is exciting and why space travel is one of the things we should invest in for our future. "Going to Mars is my dream, but even more than that is the importance of us getting to Mars as a society," Harrison said. "So when it comes down to it, the work that I am trying to do now and that I hope and intend to do until the Mars launches happen, is not really about me but about someone getting to Mars." For more details, see The Mars Generation's website at www.themarsgeneration.org.